Archaeologists in London have uncovered a dramatic 500-year-old male skeleton lying face-down in the mud of the River Thames. 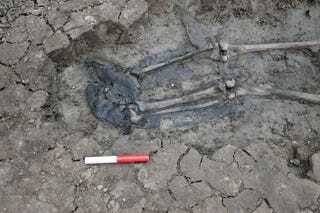 Extraordinarily, the skeleton is still wearing his thigh-high leather boots. Researchers from the Museum of London Archaeology (MOLA) stumbled upon the mysterious skeleton while conducting excavations at Chambers Wharf in Bermondsey, a site that’s being prepared for future sewer work. 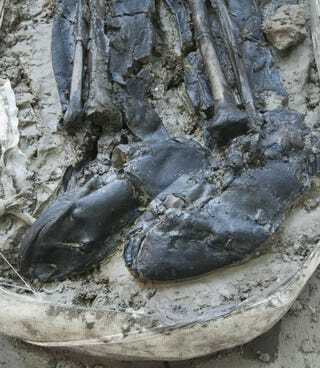 The cause of death has yet to be determined, but the location and orientation of the body – not to mention the leather boots – suggest the man drowned in the Thames some 500 years ago. At thigh-height, the boots resemble modern waders – the kind worn by fishermen, sailors, and mudlarkers (people who sift through mud in search of valuable objects). This man may have tragically fallen into the Thames and drowned while performing his daily routine, speculate the researchers in a MOLA press release, or perhaps he slipped while trying to scale the Bermondsey Wall, which the scientists say is nearby. Richardson and her colleagues say the boots date back to the 15th or early 16th century, and they would’ve reached thigh-height when pulled all the way up. The boots were made from leather – an expensive material that was frequently recycled at the time, and not the kind of thing that was easily discarded. What’s more, the boots were of excellent quality, containing extra soles and some kind of substance, possibly moss, that was used to create a better fit or add warmth. The study authors note other clues that suggest the man met his demise through misadventure. He was found face-down in the silty deposits of the Thames, with one arm above his head and the other bent back onto itself and to the side – an orientation more consistent with drowning than deliberate burial. The location itself, at a bend in the river, serves as a natural confluence, where materials and sediment accumulate. The body, the researchers speculate, was quickly buried in mud. A bone analysis failed to reveal any obvious injuries that might have happened at the time of death, but the condition of the skeleton suggests the man lived a tough life. He was around 35 years old when he died, but he was already exhibiting signs of skeletal wear-and-tear. He suffered from osteoarthritis, so his daily life was likely associated with various aches and pains. He also had deep grooves carved into his teeth, which was likely caused by a repetitive action. The man may have created the grooves by passing rope between his teeth, as fisherman are wont to do – yet another sign that he made his living on the river.